Asbestos To Go is our asbestos removal division and we're licensed Queensland asbestos removalists. To offer this service in Brisbane, the Sunshine or Gold Coasts, you need to be licensed. 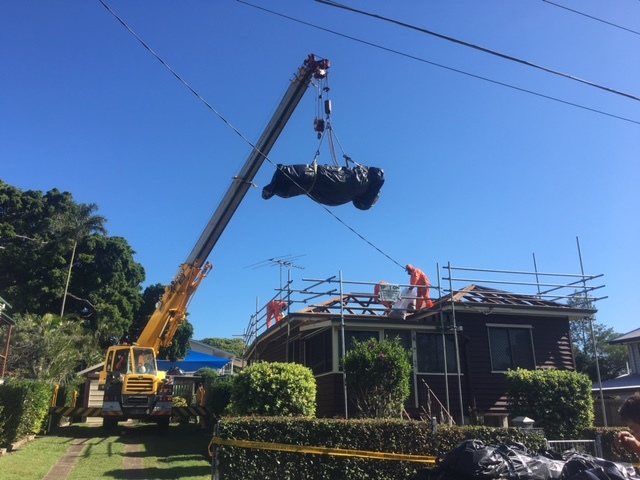 We specialise in the professional removal of asbestos roofing, guttering, walls, wall cladding and other types of bonded asbestos that can pose a risk to your house's inhabitants. Experts at removing, testing & disposal of asbestos waste, our teams have executed some of the most challenging tasks admirably. Contrary to perceptions that removal is a simple procedure, it calls for a degree of expertise and domain knowledge to execute removal across residential and commercial locations. The reasonable cost of the services will never compromise on any of the procedures, equipment or disposal. Our services have acquired seamless efficiency due to the large number of projects we have executed. It is this efficiency and professionalism that offers greater protection to inhabitants within the structures, after we are done with the removal and disposal. As premier licensed and qualified asbestos experts, our services have helped property owners get rid of potential hazards. Our services do not end with the removal but continues into the post-removal phase as well. As a contractor offering the complete suite of specialized services, you can rest assured that the independent company will issue the clearance certificate post-inspection smoothly. Our experience in this area of activity renders your structures safer, as all traces of hazardous substances are removed comprehensively. Structural safety aspects always remain an important facet of our operations, and our overall expertise ensures that you receive highly accurate updates regarding the condition of the structure. 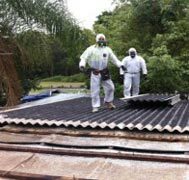 How much does it cost to remove Asbestos Roofs or Walls? How do you dispose of the asbestos? Can I stay in the home while you are removing asbestos? Do I need to notify the local council or government? Can you install lights, fans or speakers at the same time? Can I just buy the materials off you and install myself? 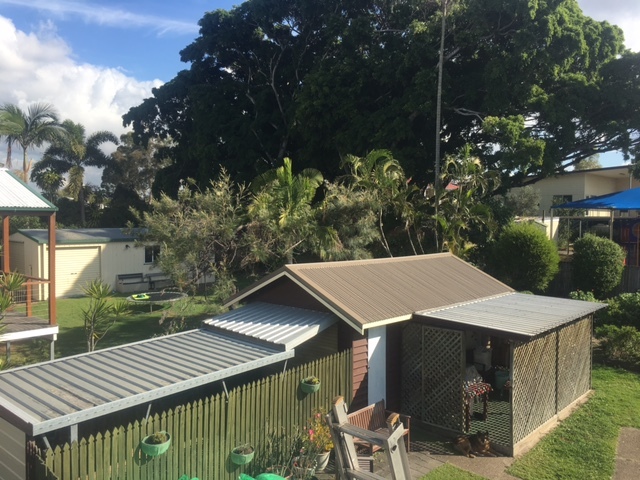 Do I need council approval for a patio, deck or carport? What payment terms do you offer? Can you help with concrete, timber decking or fencing at the same time? What brand of materials do you use? Stratco Outback? Do you help design our structure? Do I need to sign a contract if my insurance company is paying for the repairs? How long will it take for my repairs to start? What if I want you to do other work at the same time as my insurance repairs? How do I nominate you for my insurance repairs? What type of insurance work do you do? Do you do tile roofing as well? Where can I view the colorbond colours? Do you do commercial roofing? Do you provide roof inspection reports? Are you licenced and registered with authorities? What is the cost of replacing a tiled roof with Colorbond? 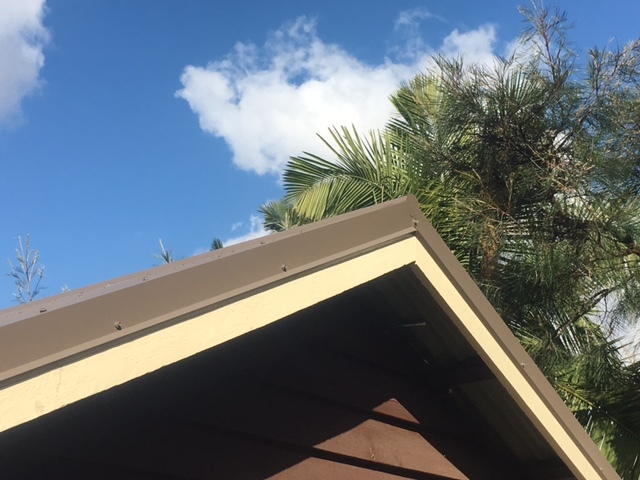 Will a new roof increase my house’s value? It is a group of naturally occurring minerals, mined from deep underground. There are three main types that were used in Australia, Chrysotile (white), Crocidolite (blue), and Amosite (brown or grey). Asbestos was an extremely popular building material prior to the 1990’s. Since then the use of asbestos has been banned after it was found to cause serious health problems to humans if exposed to airborne particles. It is safe if you take the necessary precautions and use the proper equipment when doing so. Our staff use full body suits with ventilators to protect themselves from any particles coming in contact with their body. It’s also important to use safe procedures during the removal process to make sure you don’t encourage the fibres to become airborne where they can endanger humans. whether it’s an entire roof or just supporting structural areas (eves, walls etc). We use a licenced asbestos transporter who disposes of the material at the closest registered waste facility/tip. After asbestos removal we NEVER dispose of asbestos improperly or illegally. As a precaution, we ask all residents to vacate during asbestos removal. This is usually from early morning to mid-afternoon and allows enough time for removal, vacuuming, spray sealing and an independent inspection. If you are employing a fully qualified, licenced asbestos removalist such as us, you are not required to notify any authorities as this will be done by the removalist. We notify QLD Workplace Health & Safety prior to removal and we may also notify Energex if we are working close to their infrastructure on your behalf. Yes, we can integrate down-lights, surface mounted lights, fans or speakers into your design and have them fitted by our electricians. See below for an example from one of our happy customers. Yes, we also offer supply only if you would prefer to build it yourself. Most structures will need building approval but it depends on the type and size of the structure and what it will be used for. We will determine upon site visit if a building approval is necessary and, if so, we will include this in your quote. The timeframe depends on several factors including engineering, building approval, manufacturing, current scheduling and weather conditions. We advise to allow at least 4 weeks from sign-up to commencement of building. The Stratco Outback range comes with a 15 year structural warranty and we also offer a 10yr warranty against faulty workmanship. We also include QBCC insurance so all jobs over $3300 are covered by this insurance. We offer ‘No deposit, 3 years interest free finance’ up to $25,000. For more information or to apply please go to our ‘Payment Options’ page. We also offer a discount for cash, cheque and EFT payments. Yes, we can install concrete slabs, driveways, timber decking, handrails and fencing to with your new patio or carport. Please ask us for more information or a quote. As we are an Authorised Stratco Outback Dealer, we supply and install Stratco patios and carports. We can also source materials and accessories from other suppliers should you want a design that is not in the Stratco range. We can design and build a large range of patios and carports. 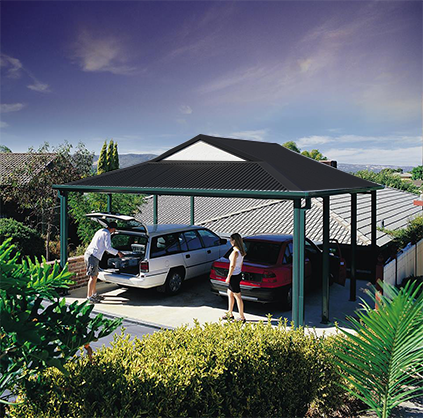 From an economical flat roof to a spacious gable, a modern curved roof, a heritage carport, an open pergola or an electric sunroof. Yes, all jobs over $3300 require a signed contract prior to work commencing. This sets out the complete scope of works, responsibilities of the repairer and the value of the job. It also give you peace of mind that the work will be covered by QBCC insurance. We aim to complete your repairs as quickly as possible. The timeframe will depend on our current lead time and if there is a particular urgency (eg. a roof leak or damaged electrical wiring). Once we have been authorised by your insurer, we will make contact and provide you with a timeframe based on these factors. Yes, you are welcome to request additional work to be done at the same time as your insurance repairs. Any work which is not covered in your claim will need to be paid for by the homeowner. Please notify us prior to work commencing if you would like any additional work done so we can quote and schedule accordingly. We offer up to 10 years manufacturer warranty on materials and a 5 year warranty against faulty workmanship. Your insurance company may also offer additional warranties so please contact your insurer for more information. Most insurers will allow you to nominate your own repairer. If you would like to request Hats For Houses, please contact your insurance company. Hats For Houses is a preferred repairer for several major insurance companies and have been operating in the industry for over a decade. We are licenced and registered with industry organisations such as the HIA, MBA, QBCC & MRIAQ. We also aim to complete your repairs in the quickest time possible and to the highest standard whilst maintaining a high level of customer service. We specialise in damage reports, emergency make-safes, tarping, roof replacement and repairs, asbestos removal, internal and external wall cladding, painting, electrical and more. We supply and install many types of ceiling insulation and we can also remove or replace your existing insulation. Please contact us for more information or a quote. We do not supply or install tile roofing, however we would be happy to assist if you are wanting to replace your tile roof with a metal roof. We have completed many commercial roofing projects including warehouses, shopping centres, restaurants, multi-unit dwellings and more. We specialise in roof inspection reports for home owners, builders and insurance companies. This includes a site visit, detailed report, photos and, if necessary, a quotation for repairs. Please contact us for current pricing. We offer our customers a free, no obligation quote which will include a site measure in most cases. However, this does not include investigation to determine the cause of an issue. Eg. A roof leak with no known cause or location. This would require a roof inspection report. This will depend on the size and style of your roof, current scheduling and weather conditions. We can give you an idea of timeframe at the time of quoting. If there is any urgency or you require work to be done by a specific date, please advise when requesting a quote so that we can accommodate as much as possible. We are licenced with the Queensland Building and Construction Commission and we have been members of the Housing Industry Association for over 10 years. We are also members of the Master Builders Association and the Metal Roofing Industry Association of Queensland. 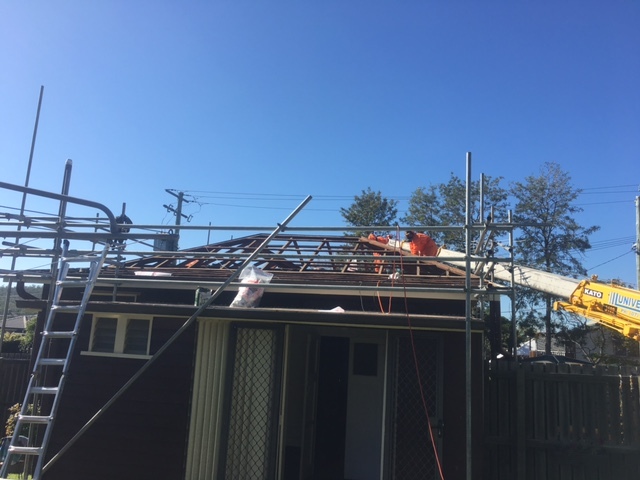 As well as manufacturer warranties on materials of up to 10 years, we also offer a 5 year workmanship warranty and all jobs over $3300 are covered by QBCC insurance. 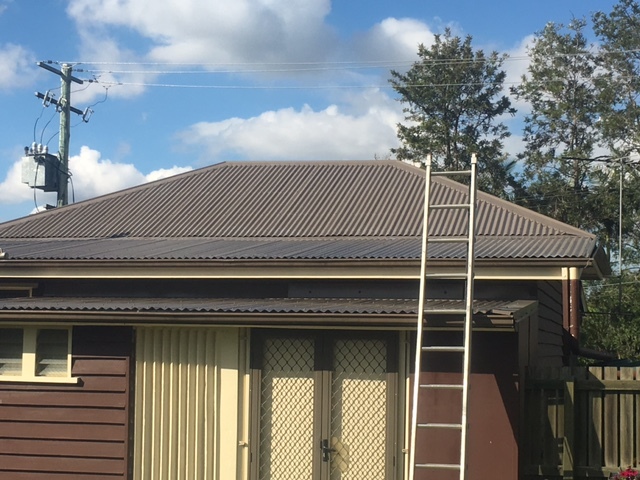 The cost of replacing a tiled roof with Colorbond or metal corrugated iron also varies significantly, but the process is much the same as a general roof replacement as detailed above. Replacing your old, rusted or damaged roof will certainly give your home a facelift which is sure to increase the value of your home and appeal to more buyers should you decide to sell. It is important to choose materials and colours which complement your house design and colour scheme. 1 – Asbestos: if your roof has asbestos in it, this would be a good time to remove it. If you think your house has asbestos in the roof read more about our removal services here. 2 – Insulation. If your roof doesn’t have insulation we would highly recommend it be included in your new roofing process as metal roofs can generate much heat without it. If you have existing insulation, it’s important to ensure it’s in good condition and suitable for your new roof. 3 -Unsafe structural support. All supporting beams will need inspecting prior to any new structure being applied on top of them. We can also arrange roof structural upgrades as we have qualified carpenters & engineers who can advise accordingly. 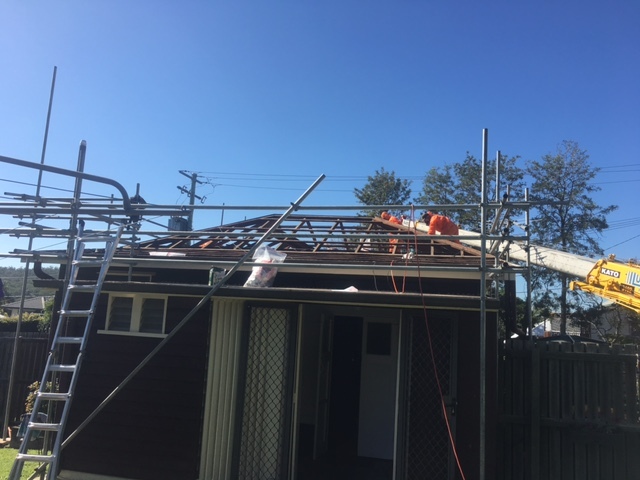 We're a roofing specialist servicing the South East Queensland area. Family owned and operated we take pride in giving residents in Brisbane, the Gold Coast and the Sunshine Coast, some of the best new carports, patios, roofs, pergolas and outbacks for reasonable prices.